Washington -- Systemic corruption of judicial systems not only denies citizens their basic human rights, but hinders economic development and sometimes pushes aggrieved populations to violence, according to a recent report. 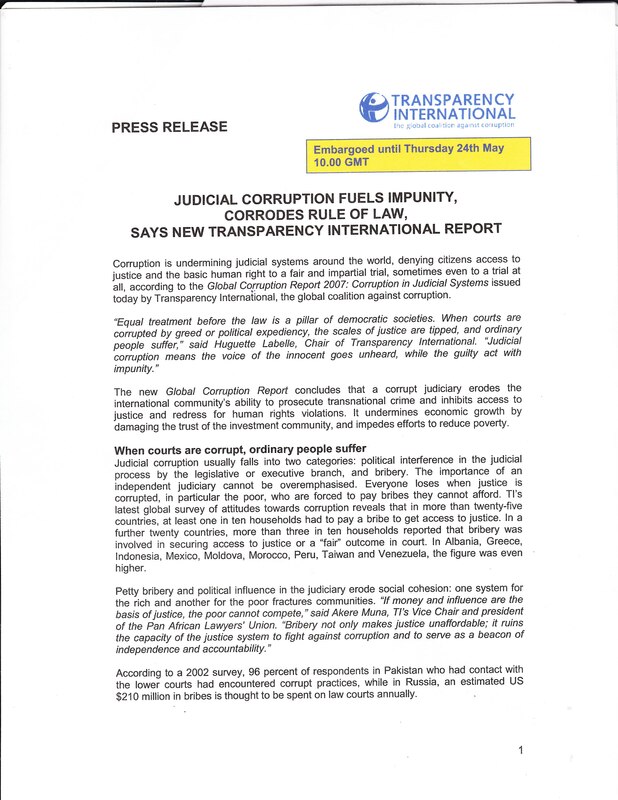 Global Corruption Report 2007: Corruption in Judicial Systems says that despite international efforts, different forms of judicial corruption continue to afflict many parts of the world. The report was issued in late May by Transparency International, an international anti-corruption nongovernmental organization. The Global Corruption Report offers an annual, systematic analysis of corruption, reporting on the state of corruption around the globe. The Global Corruption Report 2007 focuses on corruption in judicial systems and includes recommendations for practitioners, actors in the judiciary and civil society, on how to fight corruption in the sector.